Kids can play on the playground, while you lounge on the oceanfront lawn. There's nothing like a refreshing dip on a hot day. Spacious living rooms give you space to hang out after a fun filled day. You get free hot breakfast every morning in a restaurant that overlooks the ocean. The oceanfront lawn leads out to the beach. The resort has an indoor pool, children's pool and a lazy river so there's no limit to the fun. The beachfront Monterey Bay Suites features a rooftop pool along with an oceanfront pool surrounded by palmetto trees that flows into an indoor pool. Hop in for a refreshing dip or grab a lounge chair and work on your sun kissed look while the little ones splash around in the children’s pool. Unwind with a relaxing float in the lazy river or in the hot tub. Wake up every morning to complimentary hot breakfast overlooking the Atlantic. Young kids will love the Kids Club open during the summer months, and you’ll appreciate some time to yourself. Stay in shape at the fitness center with top-line cardio equipment. Let the kids run off their extra energy on the children’s playground – just in time for their afternoon nap. Grab your golf clubs and head to Cane Patch Par 3 Golf Course, just a short walk from Monterey Bay Suites, for a little friendly competition. Or gather all of the shopaholics in your crew and head to Broadway at the Beach. Gemini Boutique has accessories from Vera Bradley, Jack Rogers and Alex & Ani. You can never have enough pairs of Flip Flops. That’s what the Flip Flop Factory is for. Don’t worry if you forgot to pack your sunglasses; there are three Sunglass Hut locations. Brands include Michael Kors, Prada and Tory Burch. When it’s time for lunch, head to Señor Frogs, Key West Grill or Dave & Buster’s. 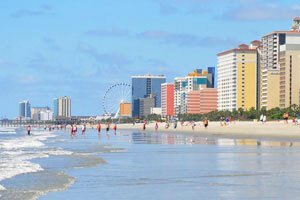 Check out the best views of Myrtle Beach on the SkyWheel. It’s almost two-hundred feet tall, and the gondolas are large enough for the whole family to ride together. Kids stay free! Up to 4 children under 17 years old stay free when using existing bedding.